Award winning artist and illustrator Michael Cho has been painting the back alleys and inconspicuous locations around his Toronto home since 2006. 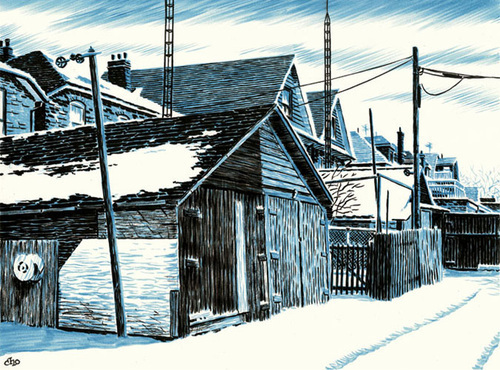 Earlier this year these works were collected and published into his new book: Back Alleys and Urban Landscapes (Montréal: Drawn & Quarterly, 2012). Born in Seoul, South Korea, Michael Cho immigrated to Canada at the age of 6, and continued his lifelong practice of drawing on any surface he could find. A graduate of the Ontario College of Art, Cho divides his time between freelancing on illustration assignments and drawing comics (preferably ones he writes himself). See Michael Cho’s website, here. My dear Michael Cho has good painting and he is a good painter also. Yes, he’s really got it, hasn’t he. Thanks for taking the time to leave your thoughts. Phenomenal talent. I’m blown away. I can only imagine what they look like in real life. Yep, and this is one show I really want to go see. 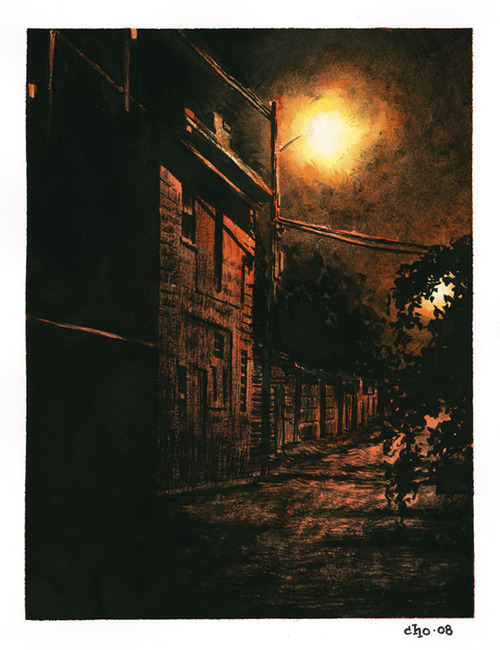 Lived for a long time in Riverdale and love the alleys there. Very interesting limited color palette; what’s his medium? Hard to distinguish. Good question: He snaps photos, then produces work from them. He creates in all media and combinations: watercolour, gouache, ink, markers and coloured dyes.